Spring is almost here – or at least the Groundhog says so! With spring arriving early this year, and temperatures already on the rise, now is the time for your readers to plan their Spring Break! Whether planning to visit friends abroad, lay on the beach with family, or simply relax at home this vacation, Affiliate Window advertisers have hot deals on spring travel, fashion, activities and more! Promote these sweet offers today so your readers can plan now, and enjoy later! Not already working with Affiliate Window? Join now! See a product you want to promote? Download myAW to easily join programs and generate links! For a full list of ALL offers listed below, please download the Offers Feed here. 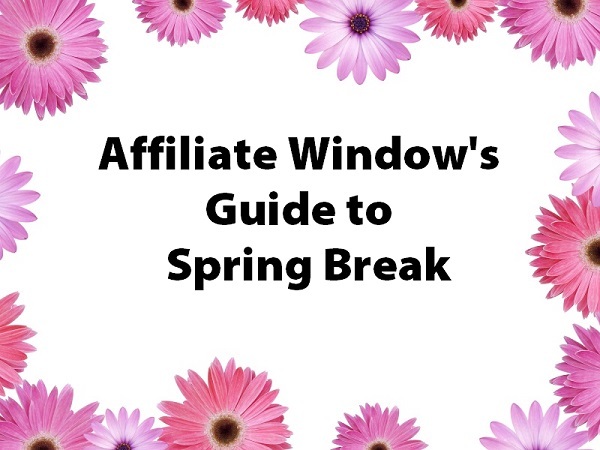 Escape the cold this spring with Affiliate Window travel merchants! From the Caribbean to Las Vegas and everywhere in between, our merchants offer the best prices on hotel stays, all-inclusive vacations, advanced boarding passes and more! Planning a winter getaway or European adventure? Our merchants offer buzzing deals on travel all over the world! Offer: Save up to 50% off this Spring Break! No booking fees ever! Offer: In a rush to get away this spring break? Cut down on time spent waiting in line during travel and get 2 months of CLEAR, for just $19! Offer: Plan now, party later! Book your Spring Break stay in advance at Design Hotels and benefit up to 20% off the best available rate. Offer: Spring Break deals! Lonely Planet is offering 20% off digital and print guides to top USA, Caribbean and Mexican Spring Break destinations. Offer: Attention students! Qatar Airways is introducing an exclusive offer for students traveling from India to Australia, Canada, Europe, UK and USA – free excess baggage! Offer: Caught the international travel bug? Purchase your Spring Break booking in advance and Get 10% discount on best flexible rate at Millennium & Copthorne Hotels, New Zealand! Terms: Offer valid on New Zealand properties only. Offer: Booking a romantic getaway for two this Spring Break? Save up to $200 per couple when traveling to Secrets or Dreams Huatulco! From the beach to the ski slopes, your readers must check out these sizzling deals below on new spring collections for all of their sunny (and snowy) must-haves! Offer: Hit the slopes this spring break with Superdry Snow – full tech outerwear combined with tough, breathable fabrics! Offer: Spring is here! It’s time to start fresh and shop Jack Wills new arrivals! Offer: Shop Desigual’s spring ’16 collection – Here I Come Spring! Full of jackets, jeans, t-shirts and more for both men and women! Offer: Shop handmade swimsuits at Etsy! Offer: Find the perfect swimsuit cover up for your Spring Break Trip, PLUS free shipping in just 3 business days on all US Orders $30 or more! Accessories are an easy and inexpensive way to spruce up your readers’ Spring Break this year! Aside from huge discounts on jewelry and scarves, Affiliate Window merchants offer the latest and greatest items to accessorize any Spring Break with tech gadgets and beauty products! From cameras and selfie sticks to record adventures, to shoes and hats for the whole family, promote these deals today so your readers can order in time for their vacations! Offer: Shop the perfect pair of sunglasses for your Spring Break trip! Offer: Shop for Spring Break without lifting a finger: $10 discount off your FabFitFun Box! Offer: Put your best fashion foot forward this Spring Break- 15% Coggles Internationals! Offer: Travel for Spring Break comfortably: Micro Bead Travel Pillow, PLUS free shipping to the US! Offer: Get her the Spring Break accessories she never knew she needed! 10% things for her! Offer: Capture every moment of your Spring Break with the newest recording devices Up to 53% off! Offer: Look your best for Spring Break with 15% off your purchase at the Body Shop! Offer: Keep your skin safe this Spring Break – Shop sun care at Beauty Expert! During time off from work and school – let Affiliate Window advertisers help your readers discover the best entertainment from concert tickets, Wizard World conventions and attractions! Staying home this year? Check out scorching savings on home décor and fitness gear to make Spring Break the most relaxing one yet! Offer: See Rihanna LIVE to make your Spring Break the best one yet! Get tickets at Ticketmaster before they sell out! Offer: Going to Las Vegas for Spring Break? Get your ticket to Las Vegas Comic Con to see your favorite celebrities! Offer: Enjoy the ultimate celebrity experience this Spring Break! See your favorite stars in Las Vegas, Washington D.C., Las Vegas and more! Offer: Heading to Orlando for Spring Break? Don’t forget to experience The Orlando Eye and breathtaking views of Central Florida! Offer: Just in time for spring – stock up on clothing and footwear with 60% off on Clearance items, plus get FREE delivery on orders over $99! Offer: Get the toned Spring Break body you always wanted with Slendertone muscle toners! Get 10% off $120 today! Offer: Staying home this Spring Break? Make your backyard feel like a vacation spot with outdoor gifts from LBC Modern! Free shipping on orders over $50!